Me, my brother and cousins used to go to this bakery near my nanamma's house and relish puffs and pastries of all kinds.Puffs are puff pastry sheets filled with boiled eggs seasoned with salt and red chilly powder or mixed vegetables, or minced chicken curry or minced meat curry. They are generally served with tomato ketchup. 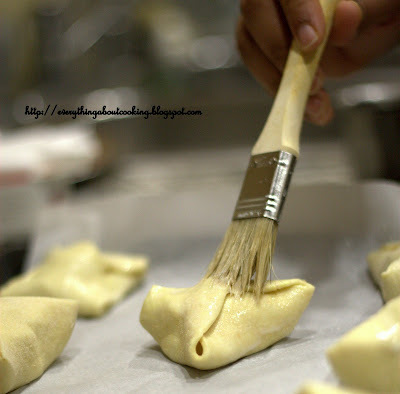 Making puff pastry from scratch is such a pain and time consuming, hence never tried making it before and thats when I came across puff pastry sheets. 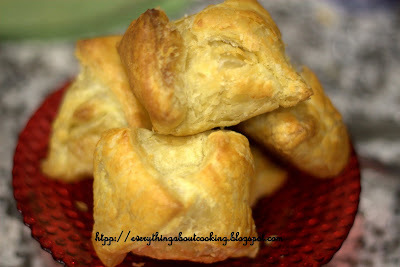 Now, making puffs is a breeze and I make them when ever I feel like having 'em. 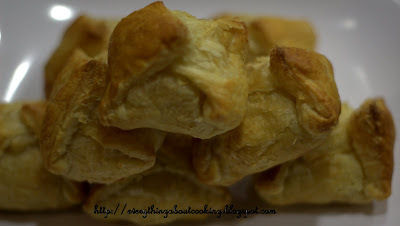 I made egg puffs when my bil visited us a couple of weeks ago. 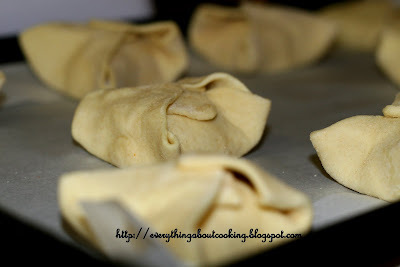 Thaw the puff pastry sheets as per the instructions on the box. Mean while, heat oil in a kadai. When hot, add the curry leaves, sliced onion and green chillies. Let cook till onion is translucent. Add ginger-garlic paste and saute till the raw smell disappears. Add turmeric, salt, red chilly pwd, fennel pwd, garam masala, sugar and saute for 2-3 mins. Place thawed pastry sheets on a floured surface and cut each sheet into 9 equal parts(u'll get 2 sheets in a box so it would make 18 equal squares). Lighty roll them(do not make them too thin). 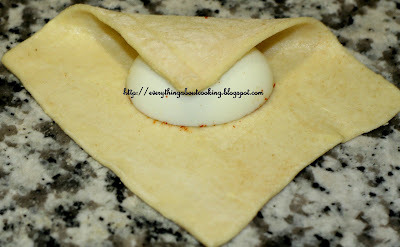 Place 1 tbsp of mixture on one piece and place the halved egg, cut side down on this. Brush water on all four sides and fold each corner into the middle and seal . Repeat with all the remaining. Brush with milk or egg wash (egg beaten). Preheat oven to 400 degrees F and place the baking tray in the oven and cook for 22-24 mins (check in between) or until they turn golden brown. Great recipe Bhagi. 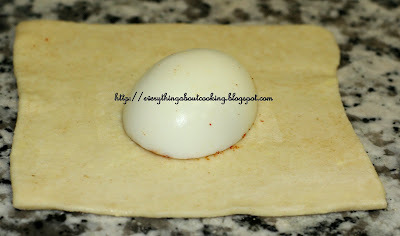 we love egg puf every weekend when we are out in the park we always snack upon this lovely spicy puffs. thanks a ton for sharing this.